Honey-sweet, juicy taste of a honeydew melon on a warm summer day. 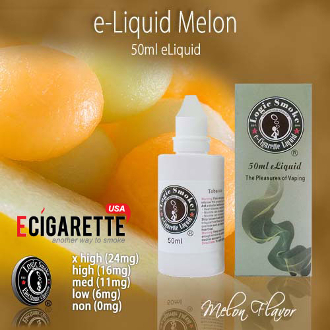 The Logic Smoke melon flavored e-liquid will surely satisfy your taste buds and your vaping needs. Is a fabulous taste sensation vape alone or when mixed with other Logic Smoke flavors such as apple, mango, fruit mix or other fruity flavors. With the perfect blend of an 80/20 PG/VG mix (propylene glycol and vegetable glycerin (organic, food grade preservative compounds), you'll get the best flavor concentration along with the perfect amount of vapor to satisfy your vaping needs.